Spigot and socket joints are widely used in PVC pressure pipes for potable water distribution and transmission and sewer force mains. When the pipeline is subjected to internal pressures, the resultant thrust forces on the pipe joints can cause joint separation. In straight runs of pipes, the thrust force at each joint is balanced by the reaction of the adjacent joint and, in underground systems, by the frictional resistance between the pipe and surrounding soil. The thrust forces which result at joints due to changes in the direction of flow or changes in the diameter size of a pipeline must be counterbalanced to prevent joint separation. In many countries this is accomplished by using concrete thrust blocks or joint restraint devices or a combination of the two. In the past 15 years, use of joint restraints in PVC pipes has increased significantly in the USA and Europe while the use of concrete thrust blocks has reduced. Traditional joint restraints, ‘lug-type restraints’, are external to a piping system and must be fitted on the outside of the joint, exposing the device to in-situ soils which makes it susceptible to corrosion. Assembly is also time-consuming and prone to human error. When using joint restraints only, without thrust blocks, it is usually necessary to restrain one or more pipe-to-pipe joints on either side of the fitting, (bend, tee, hydrant, etc). The number of pipe joints or the length to be restrained on either side of the appurtenance can be calculated based on several parameters². By restraining these joints, the resultant thrust force is transferred to the surrounding soil by the pipeline itself. In a properly designed pipeline using restrained joints, the bearing strength of the soil and the frictional resistance between the pipe and soil balance the thrust forces. The pipeline becomes its own thrust block. Only joint restraint devices manufactured and tested for use in PVC pressure pipe systems should be considered. All devices should be required to conform to ASTM F1674, Standard Test Method for Joint Restraint Products for Use with PVC Pipe. These joint restraint devices are also suitable for use with modified PVC (PVC-M) pipe. 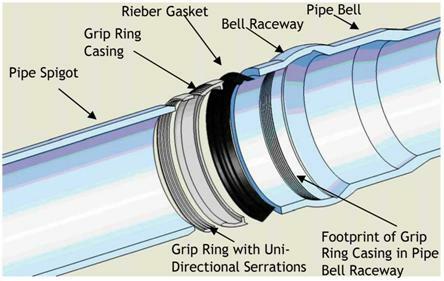 The new generation of joint restraints for PVC pipe-to-pipe connections is internal to the system and is known as the BullDog restraint joint. The BullDog is easy to assemble with minimum skills, being a standard spigot and socket jointing system. As the steel components are protected against corrosion and are not in contact with the contents of the pipeline, the joint is far less susceptible to corrosion. The seal used in the joint socket is the standard Rieber seal. When time, material and labour costs are examined, restrained joints may be more cost effective. There is no requirement to build forms, keep the trench open while the thrust blocks cure, or delay the testing of the pipeline. In crowded urban areas, the trench could be opened, the pipe and fitting installed, and the trench closed on the same day. Experience has shown that in a properly designed piping system, concrete thrust blocks can be entirely eliminated². The BullDog joint meets the requirements of ASTM F1674. Both casing and grip rings are made of ductile iron, coated with Aqua-Armor™ corrosion protection system. These two components are located adjacent to the Rieber seal in the integral pipe-end socket, as shown below. ¹Containing Thrust Forces in Municipal Pipelines: An Integral Joint Restraint System for PVC Pressure Pipe. Shah Rahman and Michelle Diamond. Plastics Pipes XIII, International Conference, Washington DC, 2006. ²The basic design of joint restraints is outlined in the American Water Works Association (AWWA) Manual Of Water Supply Practices M23, PVC Pipe – Design and Installation. NOTE: The BullDog restraint joint is available in North America in imperial dimensions only at present, in sizes up to 12 inch (300mm). Metric sizes for use with ISO or SABS sized pipes are in the process of design and manufacture and will be available early in 2009.